William Hill Poker, one of the top poker sites in the UK, runs on Playtech software and offers its players secure financial transactions, reliable payouts and encourages its players to be responsible while gambling. It is certified by Verisign and will always keep your personal data safe and private. As the company William Hill was established in 1934, is listed on the London Stock Exchange and is part of the FTSE 250 index, you would be hard-pressed to find a more reputable and secure online poker room. The William Hill brand has a very strong reputation all over the Internet and you will find them as a number one recommendation on many leading online gaming sites. In terms of customer services, players at William Hill Poker will have access to 24/7 support via live chat, toll free telephone, fax and email. There also provide a FAQ section that will answer most of your questions. 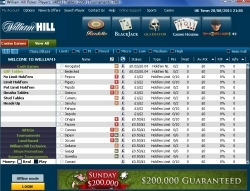 Why Should You Sign up at William Hill Poker? Here are some real good reasons for why you need to sign up at William Hill Poker as soon as possible. William Hill is one of the oldest gambling company in the world. William Hill Poker has plenty of offers for new players beginning with its 200% welcome bonus up to $2000 for new depositors. You can also get the equivalent bonus in euros and GBP. You need to earn 350 WHPoints to release $5 from your bonus and will have 60 days to clear the entire sum (WHPoints are earned by playing at real money tables). The William Hill Poker Loyalty Reward program is a juicy VIP system equivalent to internal rakeback. In essence you can exchange your WHPoints for cash, and the more you play the faster your accumulate these points. The William Hill Poker site also has two freerolls for its new players; namely $the 1,000 New Depositors Freeroll that is scheduled every Wednesday and a monthly New Depositors Prize Freeroll. New players will get 4 entries for the first promo and 1 ticket for the latter. William Hill Poker also has a refer-a-friend bonus worth $50. In addition they feature jackpot sit and go poker tournament events. Players will be able to choose from the Fort Knox Jackpot S&G, the Maui Jackpot, the Rio Jackpot and the Dirty Dozen Jackpot S&G. William Hill Poker hosts several tourneys for its players including freerolls, satellites, Sit and Go’s, weekly events and monthly events. 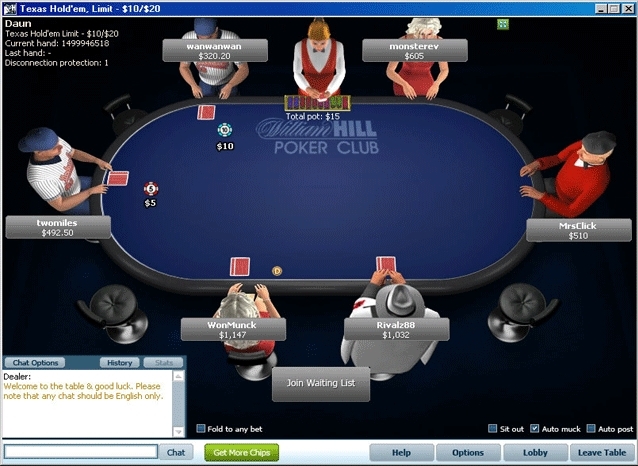 In total, William Hill Poker gives away $13,000,000 in guaranteed tournament prizes every month. Some of the more popular tourney events hosted at the site include the Guaranteed Prize Tournaments which have very large prize pools ranging from $30,000 to $250,000. The $250K Guaranteed Prize tourney runs every Sunday with a buy-in of $2.60, while the satellites for this event are held daily. The $100K Guaranteed Prize tournament takes place on Fridays while the 50K GP event is held on Saturdays with a buy-in of $109. In addition to all this, the William Hill Poker site also has a Monster $50,000 GP Freezeout and also features several freerolls given out weekly and daily. 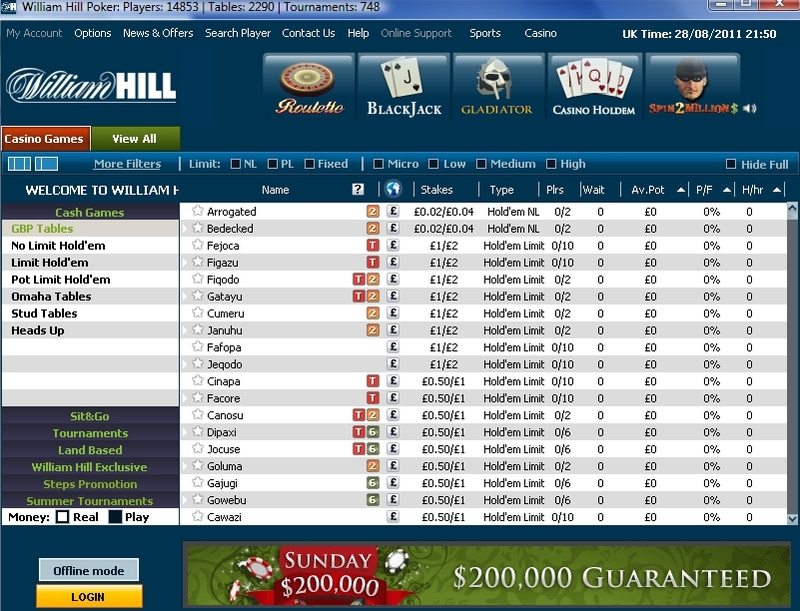 You are now ready to open an account and to try William Hill Poker. Enter William Hill promotional code BONUSTIPS when you open your account so you get access to the 200% bonus up to $2000.